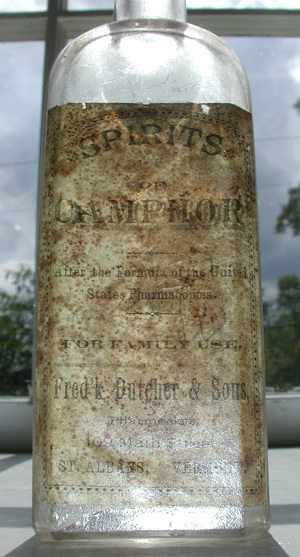 Description: This early Fred’k Dutcher label only medicine has complete label in good condition. There appears to be “clear coat” applied over label (for protection), it is very well intact. Label provides Main Street address in ST Albans. Dutcher was a successful druggist in the “pontil era” as evidenced by the pontiled version of “Dutcher Dead Shot for Bead Bugs,” a most sought after northern Vermont Medicine and Poison bottle.